Fine hand-woven silk apparel, delicious mulberry wines, teas, and jams are just a few of the delights to discover at Mulberries Organic Silk Farm in Xieng Khouang. 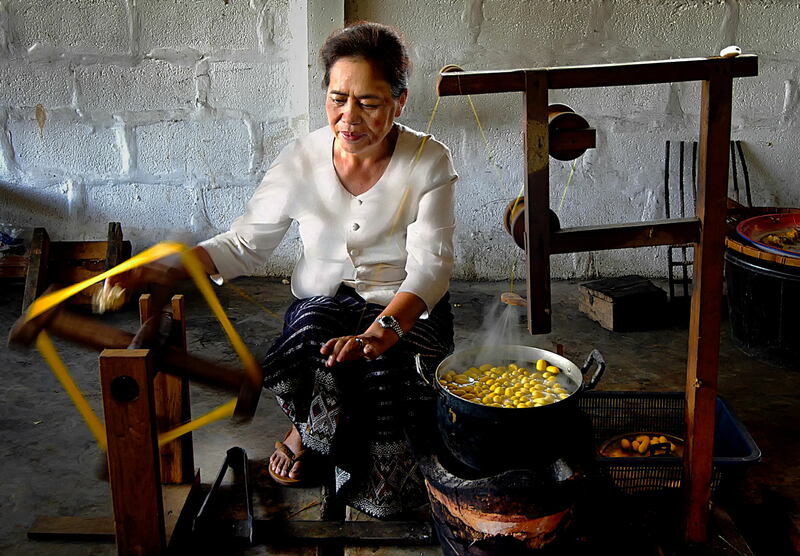 The Mulberries social enterprise, founded in 1993 by Nobel Peace Prize nominee Kommaly Chanthavong, empowers disadvantaged rural women and values environmentally sustainable practices in the community. It’s her belief that women who pass down the silk cultivation and weaving tradition have the greatest societal impact through educating their children and providing stability. Mulberries supports work-study students who can attend the local technical college on scholarships. They are mostly young women who would otherwise lack the opportunity for an education beyond primary school and are often at risk. These graduates go on to become leaders by involving their village in all aspects of silk production from cultivating cocoons and harvesting fields to weaving in their homes. On the farm there are several buildings dedicated to various stages of production which take place year round, although the peak season for harvesting is during the late summer and early autumn. In one area, a wall of small silkworm condos houses thousands of cocoons which are needed to meet the high demand for silk. Amazingly, the silkworm creates a single cocoon that produces a 600 meter length of thread. This is extracted in a boiling bath which loosens the thread, and then spun together to make the yarn used in weaving. Visitors can try their hand at various stages of the process of making fine silk products from spinning to weaving, dyeing with natural colors, or observing firsthand the life cycle and care of silkworms which no longer occur in the wild. The trainees who guide guests are cheerful and proud of their work. Visually stunning, these traditional silk products have garnered UNESCO awards for their quality and authenticity. 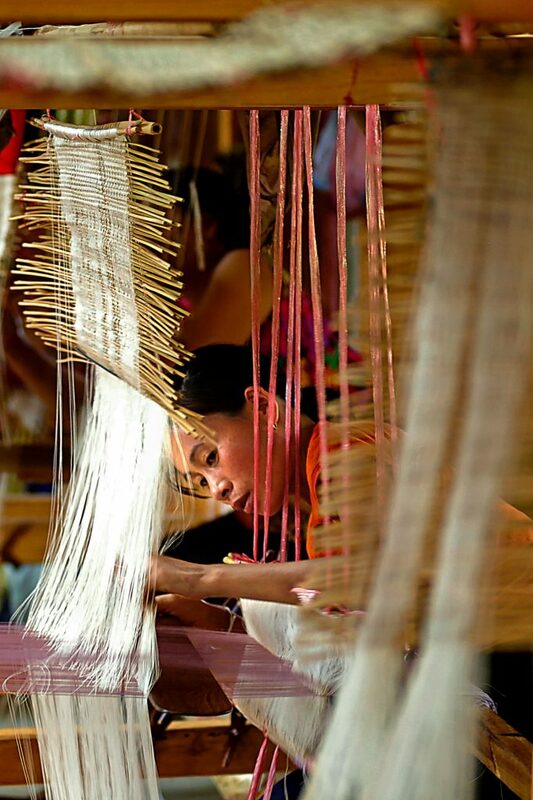 Months are required due to the life cycle of silkworms and weaving symbolic patterns often reflective of Buddhist and animist experiences into a Lao sinh – the customary skirt worn by Lao women. A simple scarf could take at least 12 full days of laboring meticulously at large looms. This love and care is what makes these products so precious. There are colors everywhere on the farm – from the luscious mulberries used to create shades of pink, red, blue, purple, and grey, to the indigo, annatto seeds, and teak leaves that create vibrant greens, yellows and browns. Visitors can’t help but breathe in the earthy freshness of the surrounding orchards with scenic vistas of rolling hills and fields of flowers filling the senses. To fully enjoy the experience, reserve a farmstay and relax in tranquility. Nothing goes to waste here. Leaves from the white mulberry tree (Morus alba) are feed for the silkworms while the berries are used to make wine, jam, tea, dyes, soaps, and fragrant shampoos. Even the larvae of the moths are sold at the market as snacks. Profits go directly to expanding the project beyond the 300 families already receiving assistance. This venture depends on volunteers, trainees, and donations to operate. For those unable to visit the organic farm, there is a retail shop in downtown Vientiane, along the Mekong River. Their products are also available online and can be shipped anywhere.